The exhibition currently on display in the National Gallery (1 Oct 2018 – 27 Jan 2019), examines the mutual influence exerted by two artists associated by marriage and admiration. This is the second of two articles considering how their work has been framed and reframed over time, concentrating mainly on the exhibited works, but including other paintings for greater depth. 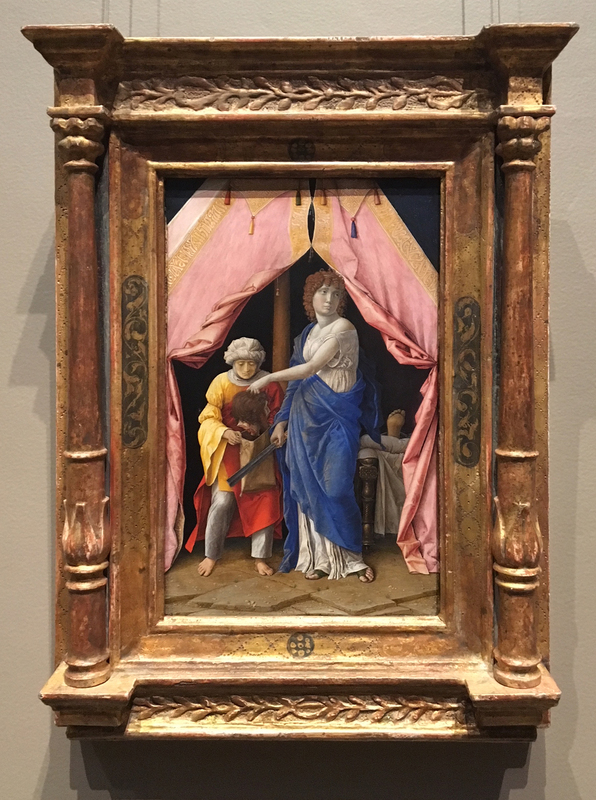 This piece, on Mantegna, looks at pictures which were reframed in the Gallery or given exhibition frames, and suggests (as in the case of Bellini) that only in framing paintings as authentically as possible is something of the context of the time to be conveyed. 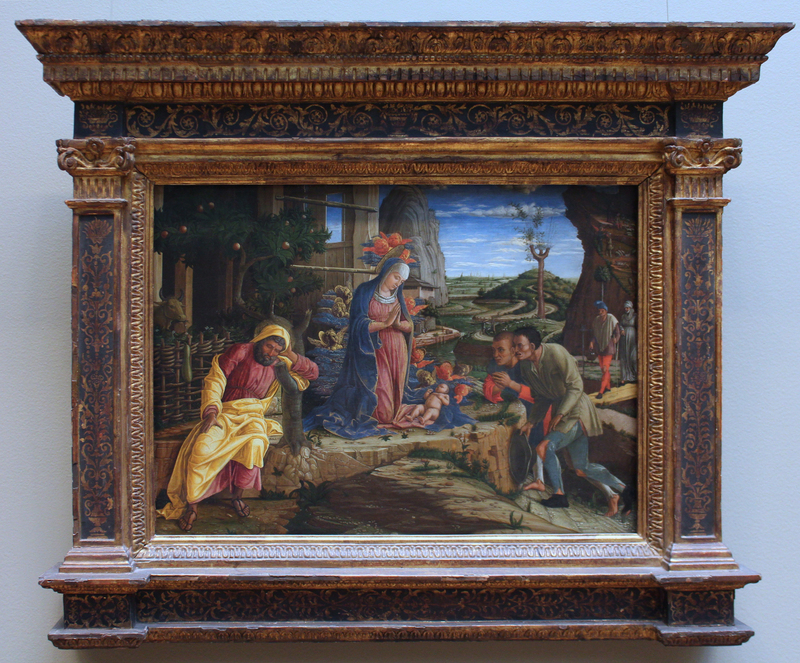 The best place to begin with the framing of Mantegna’s work is probably the one case where we know with certainty that the original setting is still in place, and where we can be fairly certain that the artist either designed the whole structure, or had at least a controlling voice in his collaboration with the carver and gilder. 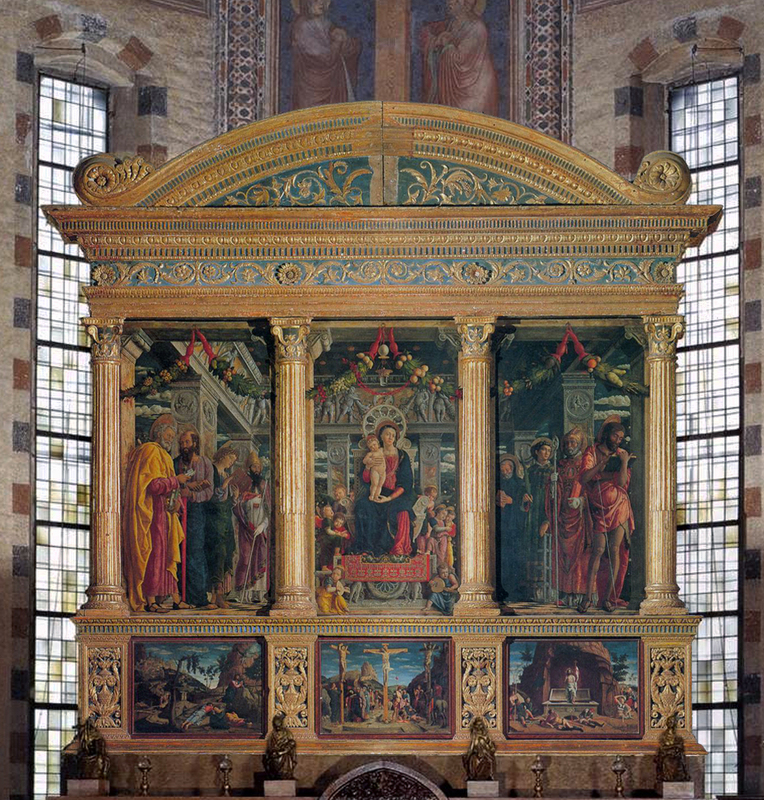 The altarpiece of San Zeno in Verona is rightly regarded as extremely influential: the painted scene – the sacra conversazione – takes place in a three-dimensional temple running back from the columns of the frame, and gives at the back onto a receding landscape, thus being united as a single vast space in a way that no Gothic triptych had been united; but the pure classicism of the design of the wooden frame itself was also innovatory for a painted altarpiece, and influenced other Renaissance frames. 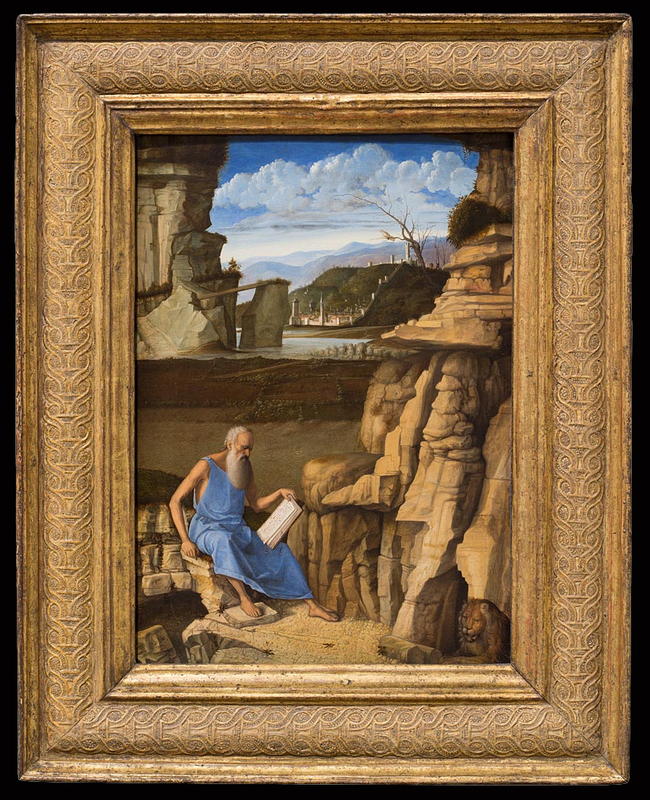 It lies, for example, behind the similarly unique free-standing wooden altarpiece frame of the Frari Triptych, by Mantegna’s brother-in-law, Bellini; here again the artist must have collaborated extremely closely with the carver (whom in this case we know, because he signed it, to have been Jacopo da Faenza). 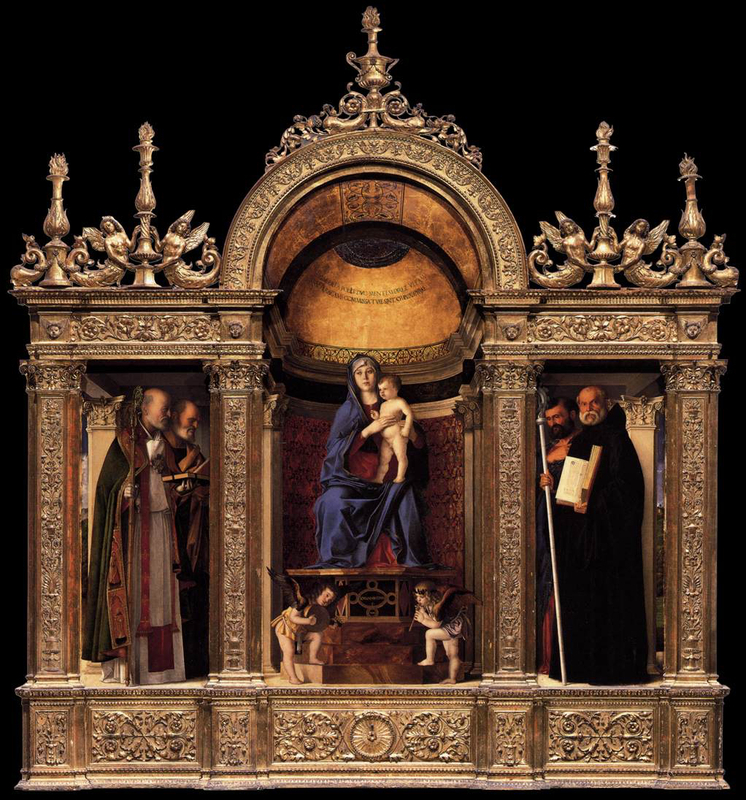 The thirty years since the creation of the San Zeno altarpiece allow for the greater sophistication and integration of the frame with the internal painted architecture in Bellini’s work even than in Mantegna’s; however, the symbiotic relationship of structure and image in the Verona altarpiece are extraordinarily innovative for the mid-15th century. The following year there was a break in Mantegna’s work; he left briefly for Ferrara after Pizzolo accused him (interestingly) of interfering in his, Pizzolo’s, work on the altarpiece; although he returned to complete the fresco cycle in the chapel. 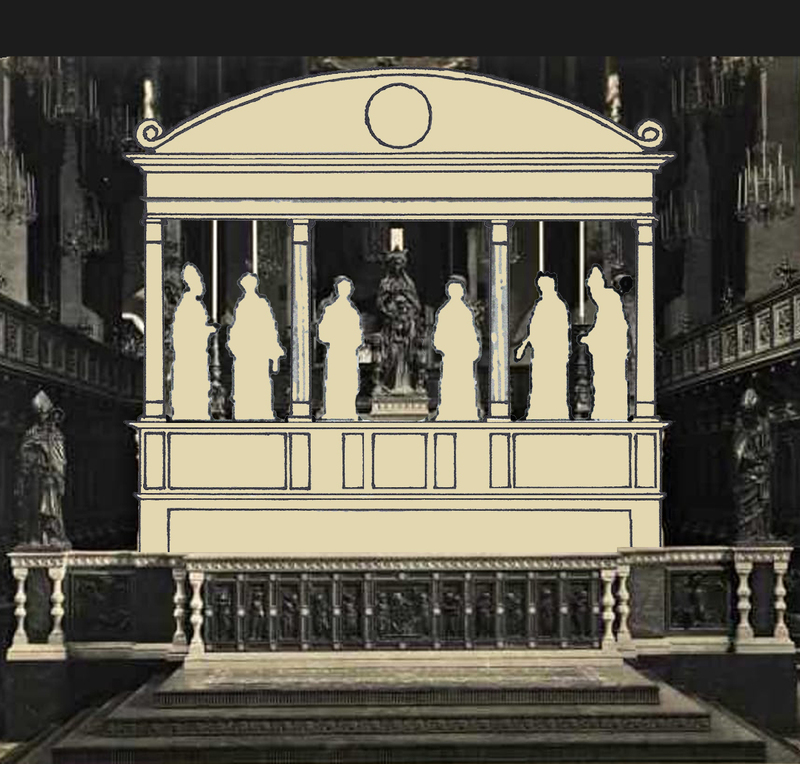 ‘About the general form of the superstructure there can be no certainty… It is, however, fairly likely, as the form taken by the majority of the modern reconstructions indicates, that its forward face resembled that of Nicolò Pizzolo’s altar of 1449 in the Overtari chapel of the church of the Eremetani… The general form, a segmental pediment with voluted ends, supported by an architrave, is repeated in Mantegna’s San Zeno Altarpiece of c.1456-59. 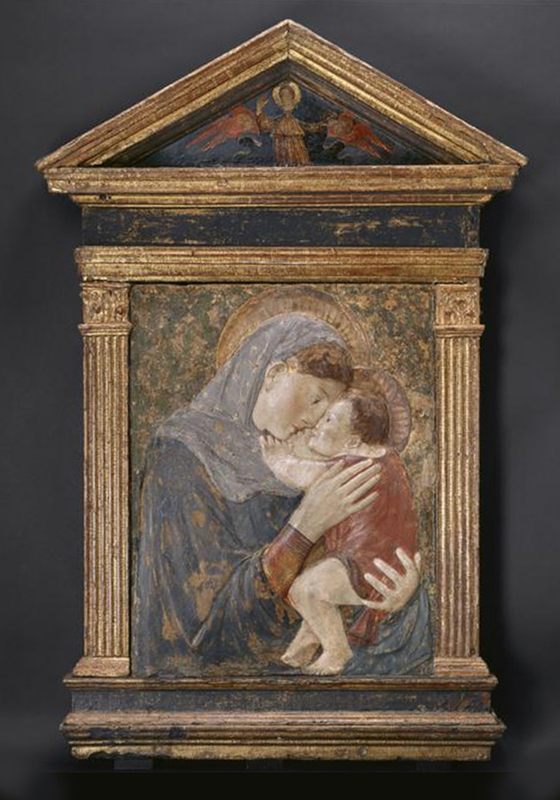 It also reflects that of the superstructure of Donatello’s own Cavalcanti Altarpiece of the early or mid-thirties’ . Most art historians are not as tentative as White, who suggests that ‘it is fairly likely that…’; in fact Martha Dunkelman remarks of the San Zeno altarpiece that ‘the form of the whole painting is universally acknowledged as a reflection of the overall format of Donatello’s altar’ ; which is quite a large claim when no-one actually knows what the latter really looked like. It does seem altogether slightly circular to argue in favour of a putative segmental pediment on Donatello’s altarpiece from the visible one on the San Zeno altarpiece, which is always traced back to Donatello’s imagined own; and, whilst artists are magpies, appropriating styles, poses, techniques, and other bits and bobs in a scrapbook sort of way, would – for example – Nicolò Pizzolo (and possibly Mantegna) have copied the presumed structure of the master’s altarpiece so closely in another church in the same city, at exactly the same time the latter was being made? 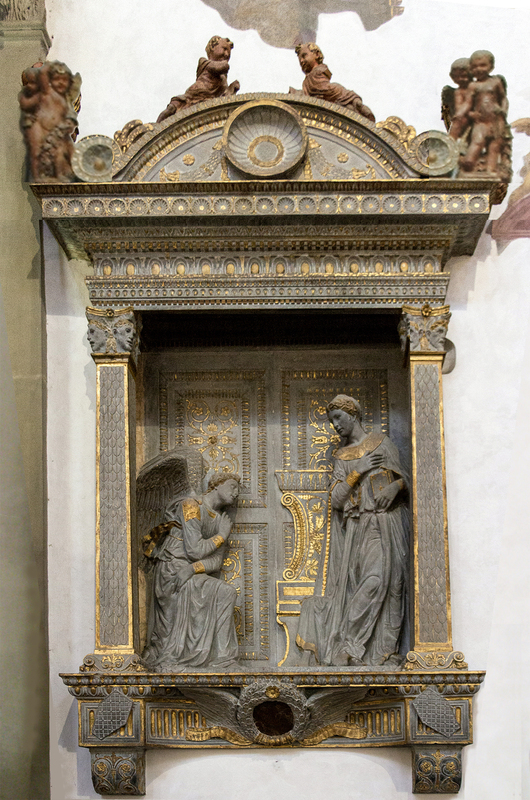 The Ovetari altarpiece was already close to Donatello’s Sant’Antonio altar in its bronze figures and relief sculptures (although the main relief panel of the former had originally been coloured and gilded). 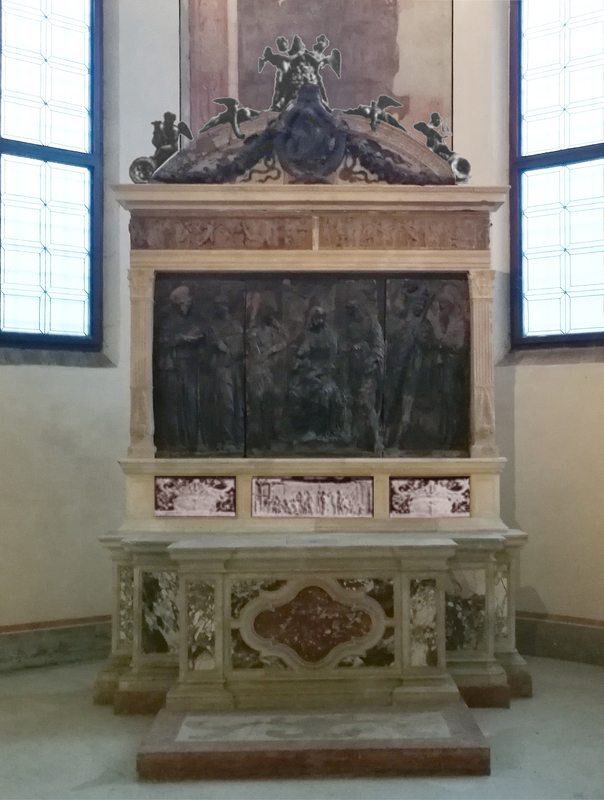 It seems much more likely that the structure, or frame, of the Ovetari altarpiece was taken from Donatello’s Cavalcanti altarpiece, as White notes; Martha Dunkelman also suggests that Pizzolo and Mantegna would have had access to Donatello’s studio drawings in Padua, and thus to his Florentine work, such as this altarpiece in Santa Croce, as well as to the poses for various reliefs, again in Florence, which Mantegna seems occasionally to quote in his paintings . 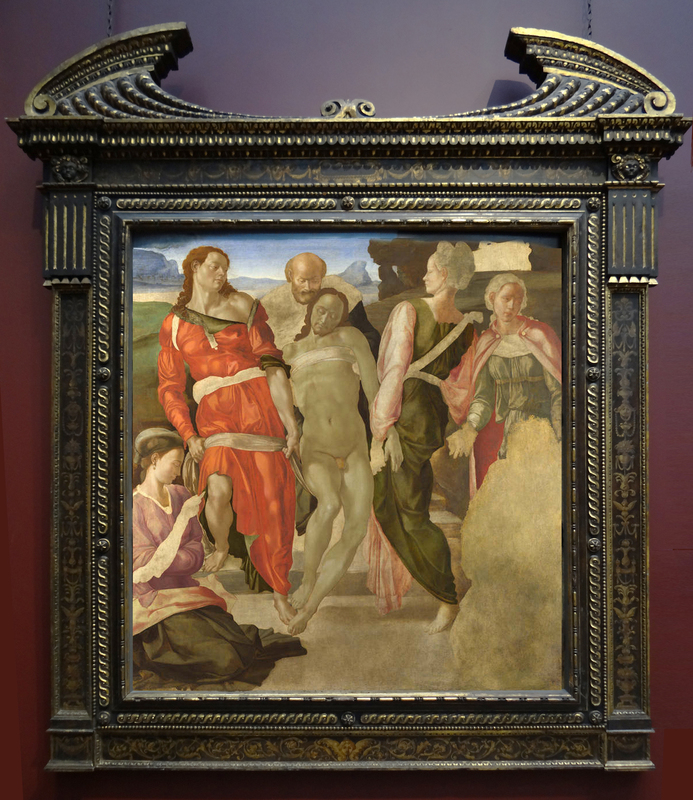 This allows Mantegna’s San Zeno altarpiece to have been influenced by Donatello’s work without deriving it from an altarpiece the only physical shape of which is extrapolated back from the San Zeno altarpiece. 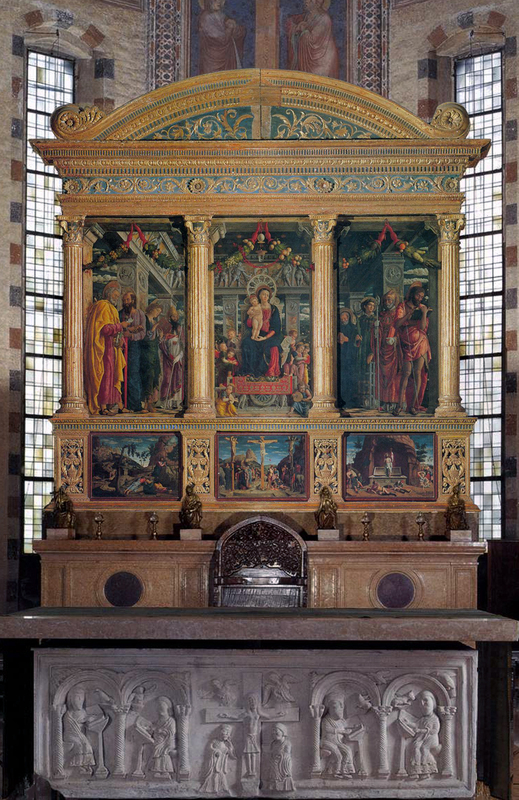 It also allows for Pizzolo (and perhaps Mantegna) to have practised Donatellesque forms on the Ovetari altarpiece, and for Mantegna then to have designed a wooden frame for his altarpiece in Verona which was as imaginative as the painting inside it. He was, after all, the son of a lignaminis or woodworker, even though he left home at the age of about ten. It is, of course, also possible that Mantegna was, like Donatello, directly indebted to whatever antiquities had crossed his own path as much as – hypothetically – to the older artist’s drawings. 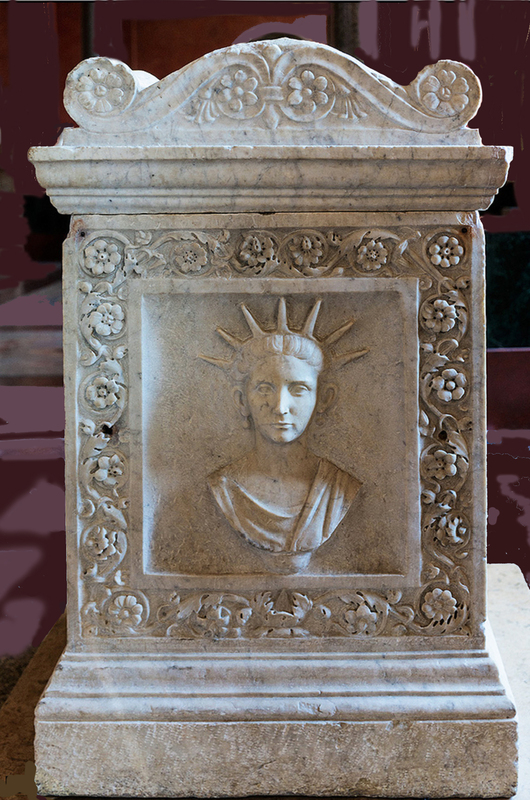 This was the age when classical sculptures and decorative fragments were collected and displayed by men who were also often the patrons of artists; it was also well before such objects began to disappear from Italy into the maws of international museums. Funerary altars with this type of pediment are relatively common, and it is interesting that the San Zeno altarpiece contains flower heads in the scrolling acroteria at either side of its pediment in markedly Roman style, as well as a frieze of scrolling foliage and varied flowers, which Donatello’s Cavalcanti altarpiece does not. – and was thus the perfect choice to carry out Correr’s commission for San Zeno, although he was still only twenty-five. The completed altarpiece reveals to what extent he was already a master of perspectival trompe l’oeil and innovation. Whatever the appearance of Donatello’s statuary altarpiece in Sant’ Antonio, it would have consisted of a flat frame at the front of an altar table, or the front of a shallow canopy over the altar table, with the figures arranged in a tableau behind it. What Mantegna did was to construct his own temple façade with four half-round columns, giving the whole object instant optical depth, and aligning the spatial recession of the painted image so that the worshipper is looking, in effect, into the front of a box – a sacred dolls’ house, where the perspective marches logically away, up the floor plane and down the roof beams, ending at the back wall of the box. This is pierced by the spaces in the loggia of square pillars supporting the back of the presumed roof vault, which give onto a rose garden and then a landscape stretching to the horizon. The worshipper is seduced into seeing frame and painting as a celestial temple built in a heavenly countryside; and then, necessarily, seeing the three panels of the predella beneath it as windows onto the landscape of earth, where three scenes of Christ’s Passion and Resurrection are taking place in the ‘reality’ of the world. The celestial temple is thus floating above the scenes on earth: this is a remaking of the Gothic Celestial Church (in the form of a 13th-14th century arched, filigreed, finialed church silhouette holding figures in individual flattened spaces) into a deep, super-real, concrete space holding naturalistic figures who interact with each other on a heavenly level whilst the world continues to happen, painfully, beneath their feet. 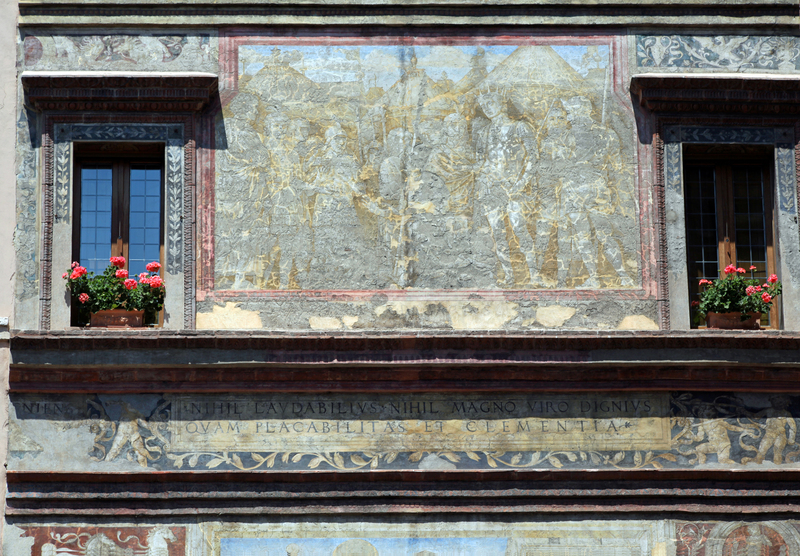 By choosing a classical façade with a segmental pediment, Mantegna expresses the order and proportion of heaven through its architectural analogue, where decoration is opulent but also restrained by linear order. There are only two moderately-sized altarpieces in the Mantegna & Bellini exhibition, one of which is Mantegna’s Virgin and Child with saints, with a frame which is fairly contemporary to it, or at least only a little later. 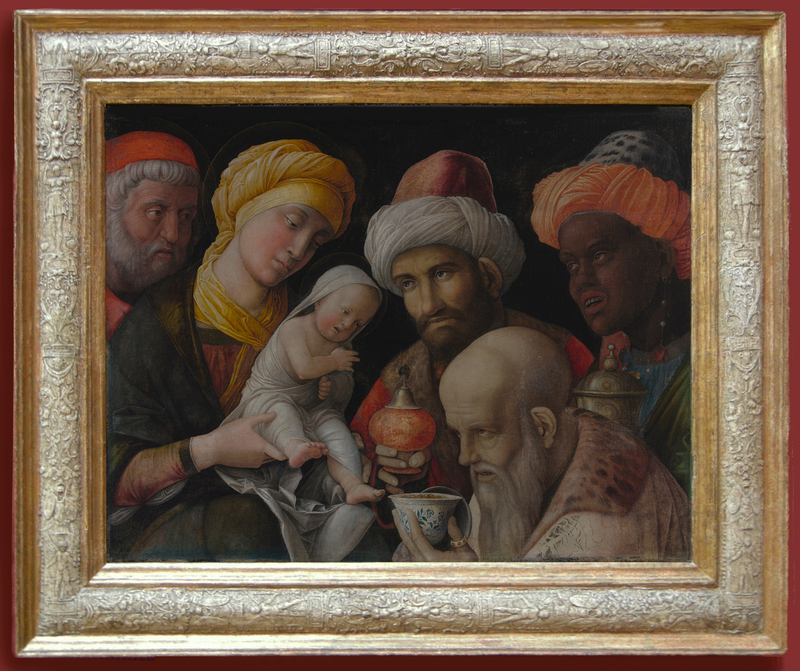 This Mantegna receives very little discussion in the catalogue (save for the fact that it is, perhaps unusually for this period, painted on canvas), and so it is particularly nice to be able to discuss its frame. The painting had spent at least two hundred years of its life in Milan, before it was acquired in 1855, without a frame, by the National Gallery. It had been in the collection of Cesare Monti, Archbishop of Milan, until his death in 1650; his collection of 221 paintings hung in the Palazzo Sormani Andreani, now the Milanese public library, and eventually ended up in the Museo del Duomo and the Brera Gallery, but this work somehow escaped. Once in the National Gallery it seems to have been given an antique frame, which had to be altered or perhaps have missing pieces replaced and also needed to be regilded, since the diary of Ralph Wornum, Keeper of the Gallery in 1856, noted on 11 April that it was ‘hung in the west Room… Frame ornamented and regilt’ . This was done by the framemaker Henry Critchfield, who worked for the National Gallery from 1854-80. In 1922 it was given a plain gilded moulding frame with an inlay by the framemaker of the day, Francis Draper junior (which made it look like a poster); but in 1946 the framemaker F.A. 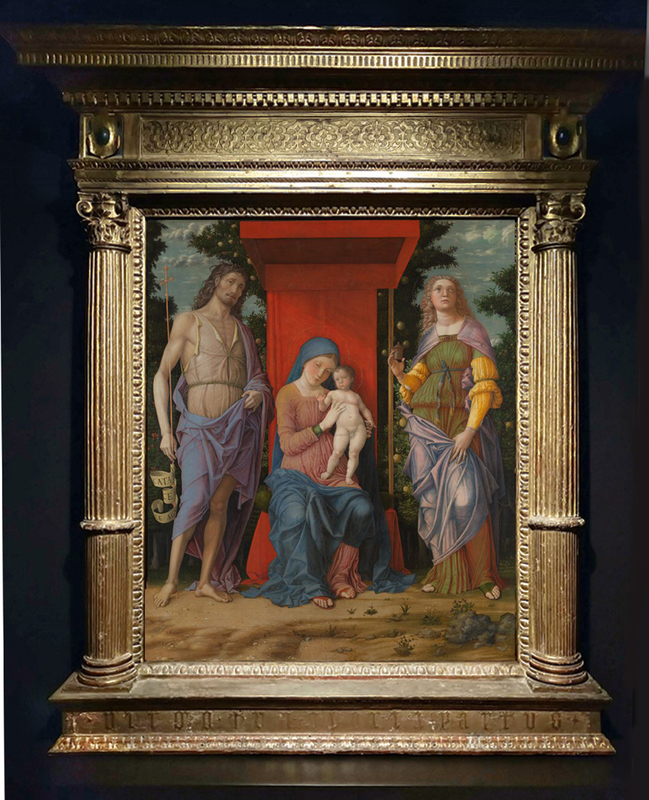 Pollak, who also dealt in antique frames, produced two stunning examples, one of which the Gallery bought for Michelangelo’s Entombment , and the other for Mantegna’s Virgin & Child with saints. It is a 16th century northern Italian frame, possibly from the Veneto, with half-columns related to those on the San Zeno altarpiece and a similar use of egg-&-dart and dentils on the entablature and at the base of the columns. The friezes at top and bottom are not carved here, though; the frieze of the entablature is decorated with a wide band of flower-like pastiglia arabesques (soft pastiglia, which is ‘dripped’ or iced onto the frieze with a type of cake-icing bag), and the predella panel with a pastiglia inscription: ‘virgo tua gloria partus’ (Virgin, your glory is in giving birth). This is satisfyingly appropriate for an image of the Madonna and Child enthroned; and the flower-like decoration of the entablature reflects the garden in which she sits, with its lemon trees symbolizing the faithful love of the Virgin, and hope in Christ. It is, all in all, a fortuitously good match for the painting. 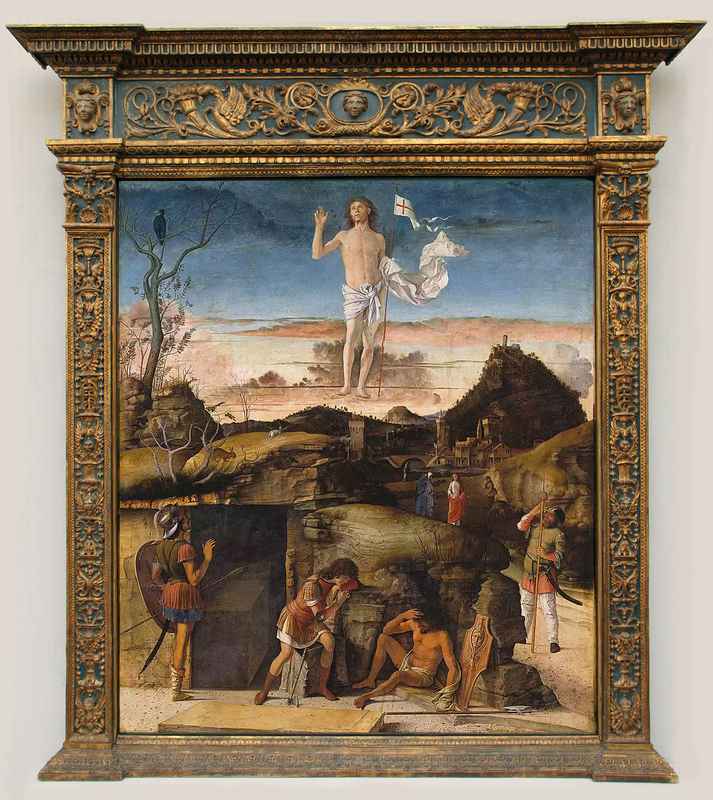 The comparably and moderately-sized altarpiece by Bellini in the exhibition is one of the so-called ‘landscape’ paintings, which Mantegna and Bellini both used as a more extensive – and also expressive – setting for a sacred subject: here, in the strikingly composed Resurrection of Christ. Earlier than and utterly different from Mantegna’s more conventional Madonna and Child, it also has a very different frame, three elements of which are antique, on a new base. Peter Schade suggests that the antique portion, with its densely-packed, rich and sculptural grotesque ornament, is Spanish in execution; the three-dimensional heads set in Mannerist cartouches on the frieze of the entablature are particularly unItalian in their cast, and the decoration of the pilasters is at a slight remove from the arabesque ornament which Renaissance carvers and painters derived from Nero’s Domus Aurea. As a setting for Bellini’s extraordinary dawn landscape and floating Christ, however, it is extremely effective, with the blue ground echoing the sky, as in the San Zeno altarpiece, and the slenderness of the pilasters undercutting the dense ornament. Other aedicular frames on works by Mantegna in the exhibition are generally both reproduction and small in scale. The Adoration of the shepherds has been mentioned in the companion article on Bellini as probably having had its frame commissioned or acquired for it by the dealer Joseph Duveen, who bought the painting in 1924. 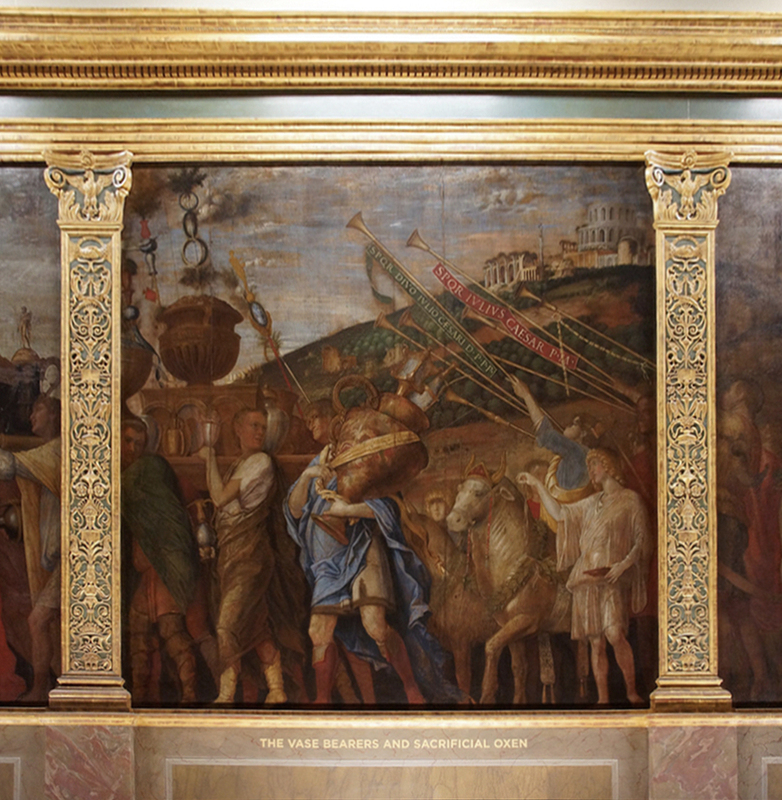 Although the sgraffito and sight mouldings are not as convincing as they could be, the frame as a whole works effectively with the painting, and is evidence of the care Duveen took to present his wares in as authentic a setting as possible. 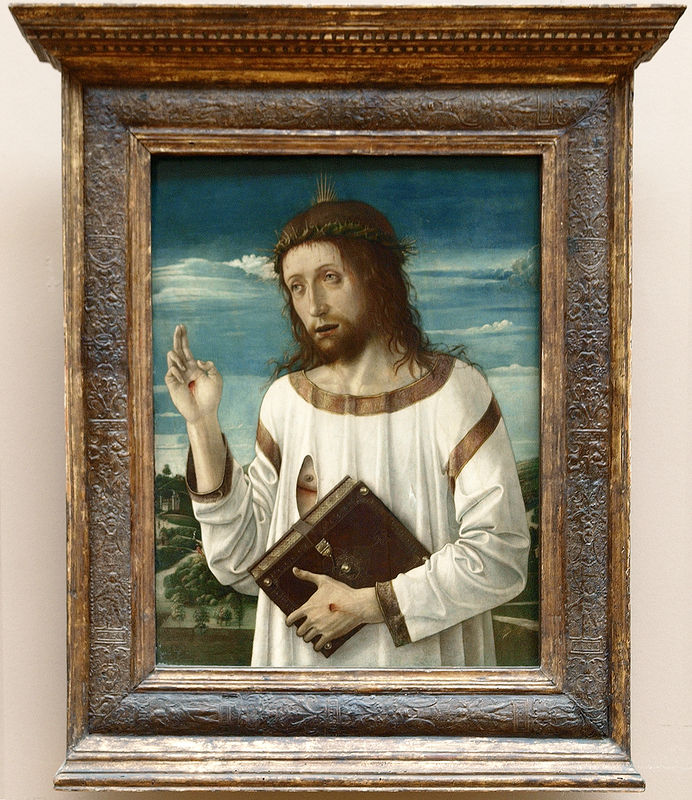 The frame of another small panel – virtually the same size as The Adoration, but in portrait format – is a 20th century revival, and was made in Madrid in 1925 by the Cano family workshop for the Prado Museum. The workshop was set up in 1907, apparently with the encouragement of the artist Joaquin Sorolla, for whom the founding framemaker worked . 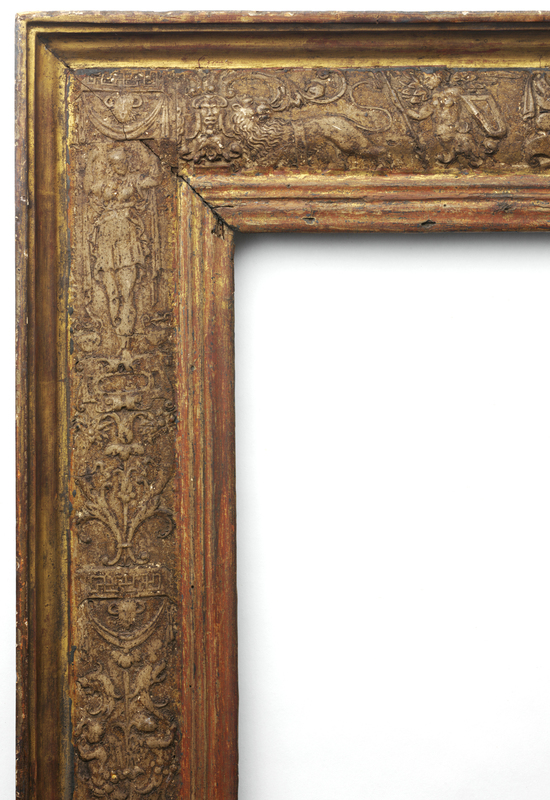 This particular design is a fascinating variation on the late 15th-early 16th century Venetian baluster frame discussed in the article on framing Bellini, which is seen in a fine original version on Previtali’s Madonna and Child with saints in San Giobbe, Venice, and also appears in the form of restelli, or looking-glass frames. 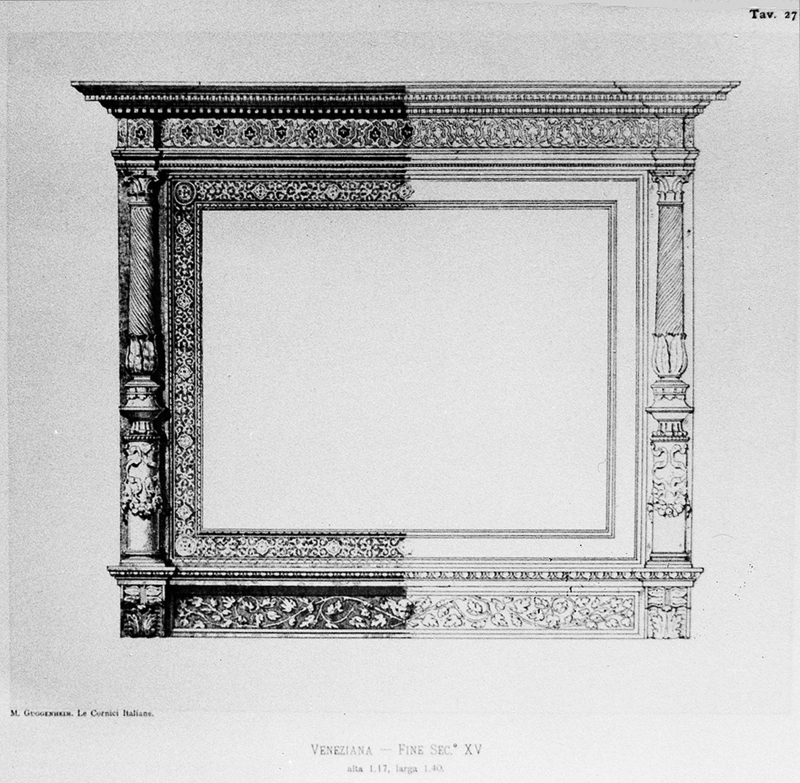 Joseph Duveen had the Previtali frame copied at least twice in the early 20th century for Venetian works he was selling, using an image published in Guggenheim’s Le cornici italiane…; but his replicas – although suffering in their proportions when they were squeezed to suit a smaller size of painting – were created with a jewel-like delicacy and opulence which reproduced the structure and decoration of the original perhaps over-meticulously. The Spanish version is more stolid, lacking the fineness and elongated lines of the Previtali frame, and altering the playful variety of the baluster columns, and the tension between carved, pastiglia and polychrome decoration. This is interesting, as the Previtali frame seems to have been known to the Cano workshop, not through Guggenheim, but from its publication six years earlier in Arte Italiana Decorativa e Industriale of 1891 . It is very true that all reproductions eventually date, labelling themselves as from their own era rather than the one they are copying; the hand which made the Prado’s ‘Venetian’ frame for The death of the Virgin is identifiable in other replicas and revivals throughout the Museum, especially on work from the 15th -17th centuries. 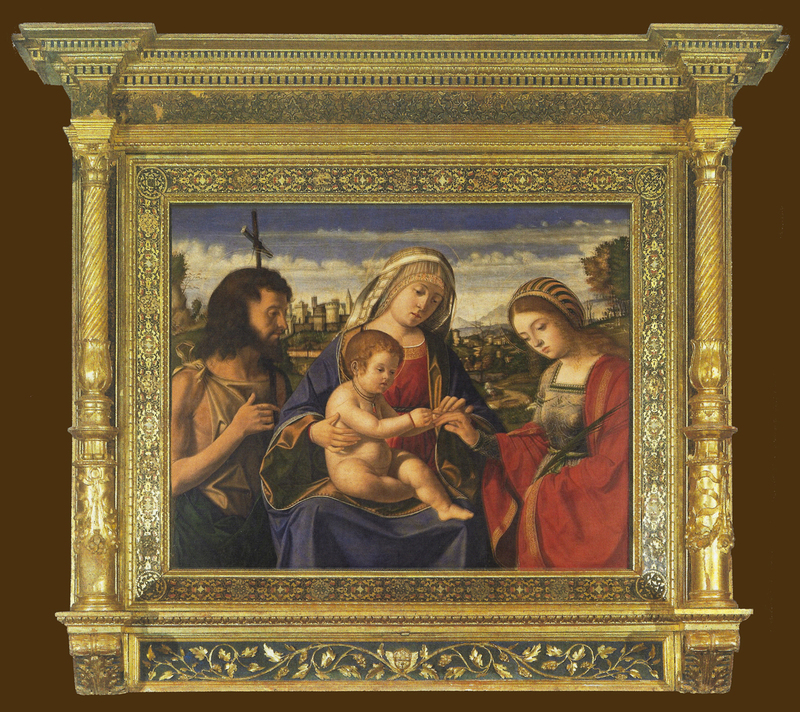 The ornament on this one is all slightly too large for the Mantegna, and the colour is not particularly flattering; but it nevertheless makes an important gesture towards an appropriate regional style of the right period – not always the first concern with 19th or 20th century reframings. A tiny panel, this Judith – attributed to Mantegna with apparent reservations – was (also apparently) in the collection of Charles I, until the king swapped it with the 3rd Earl of Pembroke. It remained in the Pembroke collection until sold by the 15th Earl during the First World War, being purchased jointly by the dealer Thomas Agnew and Duveen. 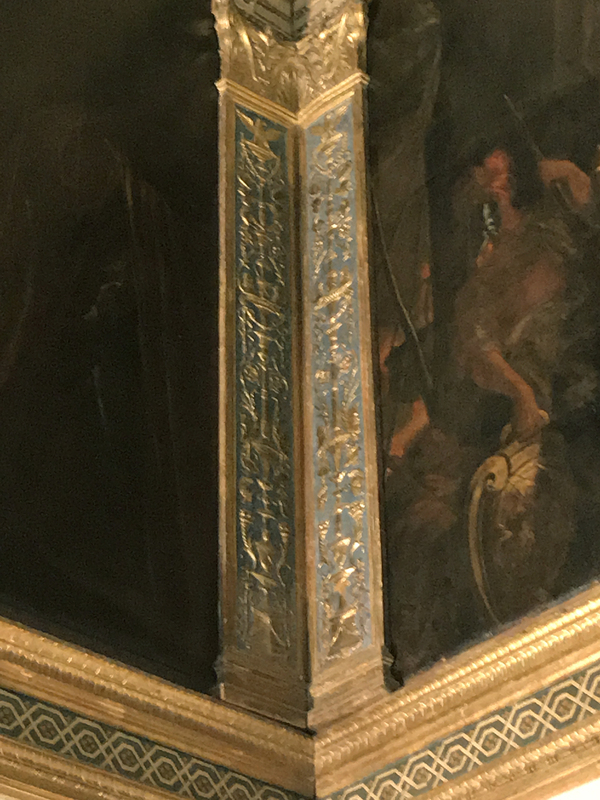 It too has a Venetian baluster frame, but one which is different in kind from the original Previtali frame, Duveen’s copies, and the Cano frame in the Prado. This one might have antique elements, although much of it looks quite rough; it might also be a 19th century assemblage or pastiche . The pastiglia decoration of the friezes is particularly crude; but the point is that all these later frames were aiming in their different ways at a specifically Venetian design of the turn of the 16th century. Here, in spite of the rather crude workmanship, it is quite effective: Judith is disclosed as if through a door between columns giving onto the night-time outside and Holofernes’s tent. 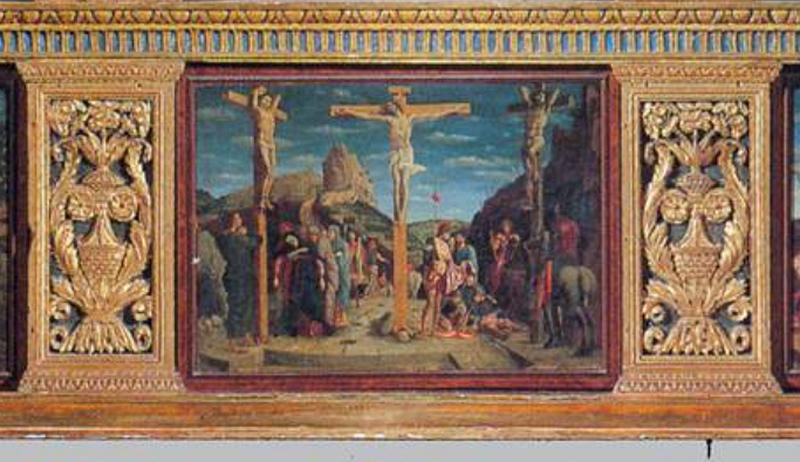 Another not-quiet-as-small Mantegna now in a 19th century reproduction tabernacle frame is his Christ as the suffering Redeemer. This has a chequered history; it was one of a number of paintings from the collection of Silvio Valenti Gonzaga, a Mantuan-born cardinal, to enter the Danish Royal Collection, and eventually the Statens Museum for Kunst in Copenhagen. It was in Gonzaga’s collection in the 1740s, and was sold with the rest of it in 1763; it retained its ‘Salvator Rosa’ into the 19th century, when it was photographed in this setting, but the disparity of styles obviously caused some past curator or director to order a reproduction Renaissance-style frame to be made for it – probably to coincide with the opening of the Danish Museum in 1896. 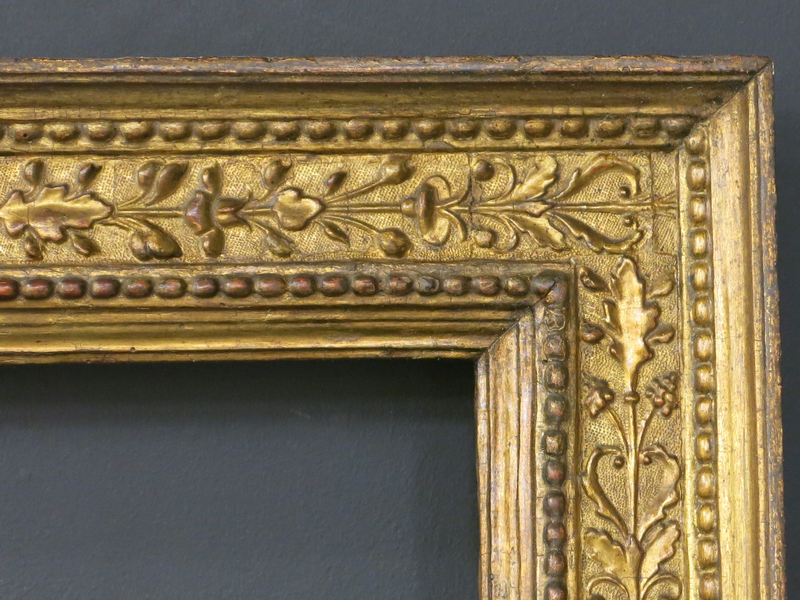 This 19th century frame lasted for about half a century and then fell victim to 1950s minimalism. It was reframed in a modern form of cassetta, parcel-gilt with a black-painted frieze; but when the painting was conserved a few years ago, the Renaissance-style frame was restored to it, ‘out of historical regard for the collection’. 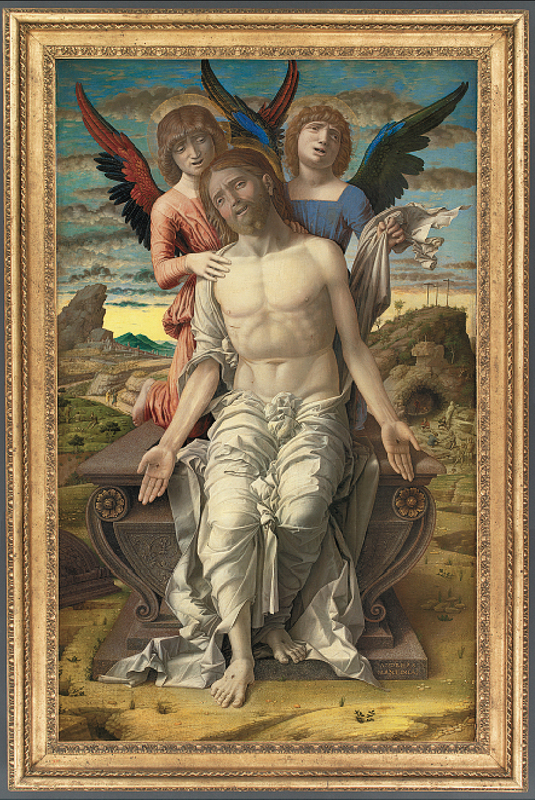 It is a very busy frame, however; the image of the dead Christ and two attendant angels fills almost the whole of the panel, and the restless surge of wave-like ornament above and below, and the different, vertebrate ornament at the sides is quite intrusive – apart from the strangely top-heavy entablature. The Adoration of the shepherds in the Metropolitan Museum has come off incalculably better in the lottery of frames which either serve or overwhelm the painting. 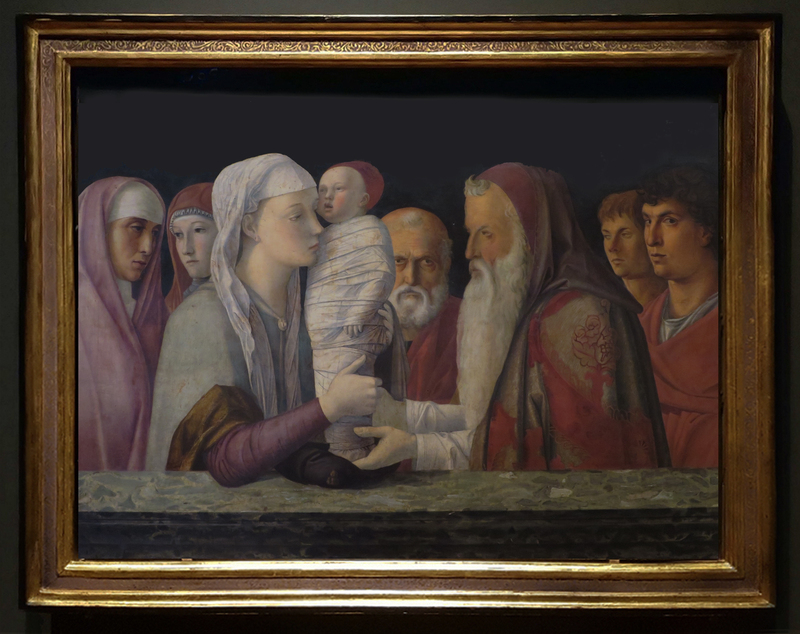 This (above) is, conversely, a particularly successful reframing of a Mantegna inspired by Donatello’s marble relief panels of the Madonna and Child. 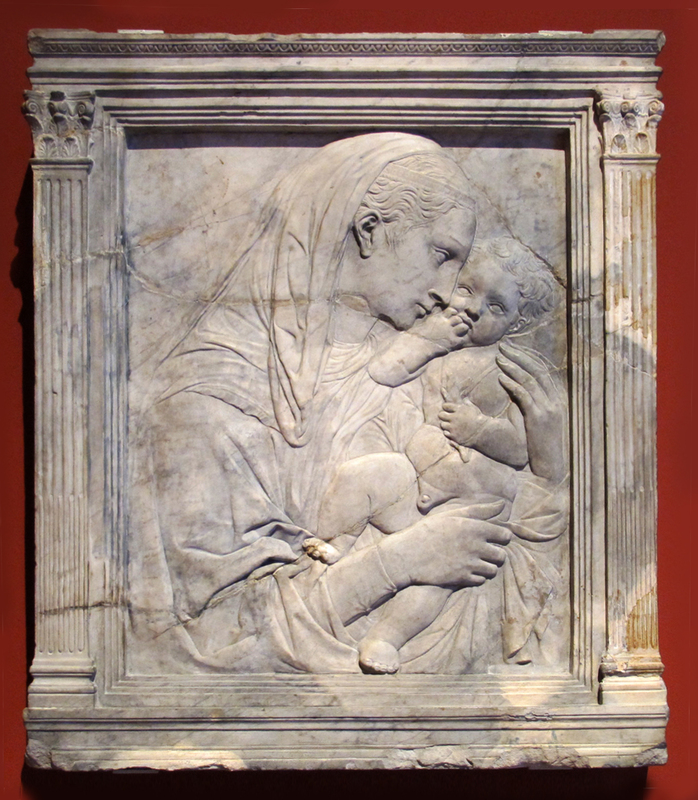 We know how some of these (also those by Donatello’s peers and followers) would have been framed, simply because they sometimes have integral carved frames – circular mouldings on tondi, plain fillets outside rectangles, and the odd more explicitly classical frame. Probably because of such integral classicizing frames (of which Michelozzo’s is an early example), those relief panels which had no border at all began at some point to acquire wooden frames in the same style – mainly quite plain, with no more ornament than a fluted Corinthian pilaster. There is a collection of reliefs in the Bode Museum, Berlin, framed in variations of this type, with flat entablatures, round-arched tops or triangular pediments. 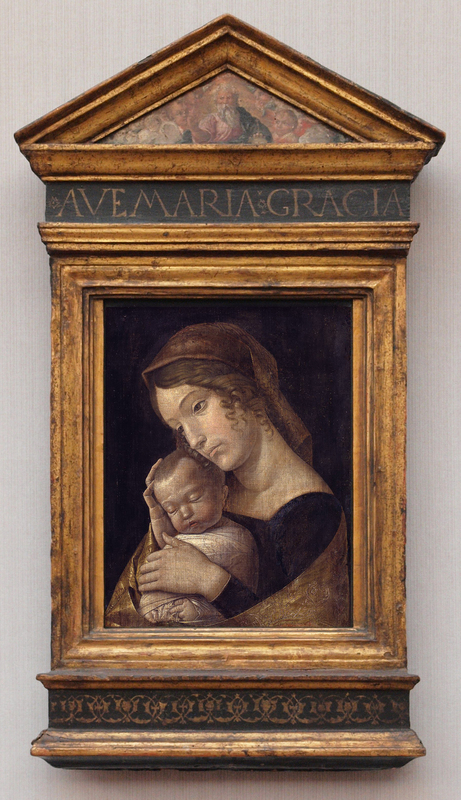 Given the monumental effect of Mantegna’s painted Madonna, the narrow range of colours, and its general similarity to a carved shallow relief plaque, the choice of a classical frame of this kind – with a painted image of God the Father in the pediment and the inscription, ‘Ave Maria gracia’ (Hail, Mary, full of grace) – could hardly be bettered; and the inlay added at both sides to fit frame to panel is almost unnoticeable. The debt of the composition to Donatellesque Madonna plaques is underlined, at the same time that Mantegna’s painting reaches beyond a sacred image to the depiction of a real mother. 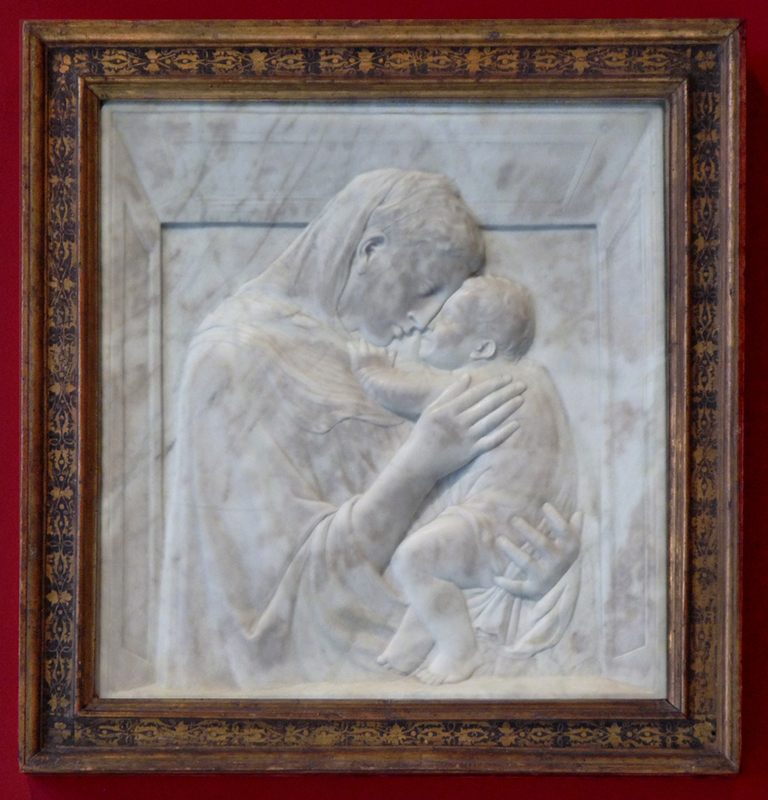 This refers, of course, to the receding niche around the Madonna, rather than the later sgraffito’d cassetta; although the author goes on to link the two works, not by their framing techniques, but in the mutually close pose of the mother and Child. However, Mantegna, like Donatello, has also presented his scene in a stone window niche, with enough recession for the sill to support the Child and the Virgin’s elbow (his perspective is more successful than Donatello’s, whose junction of sill with side wall could have done without the internal panels). 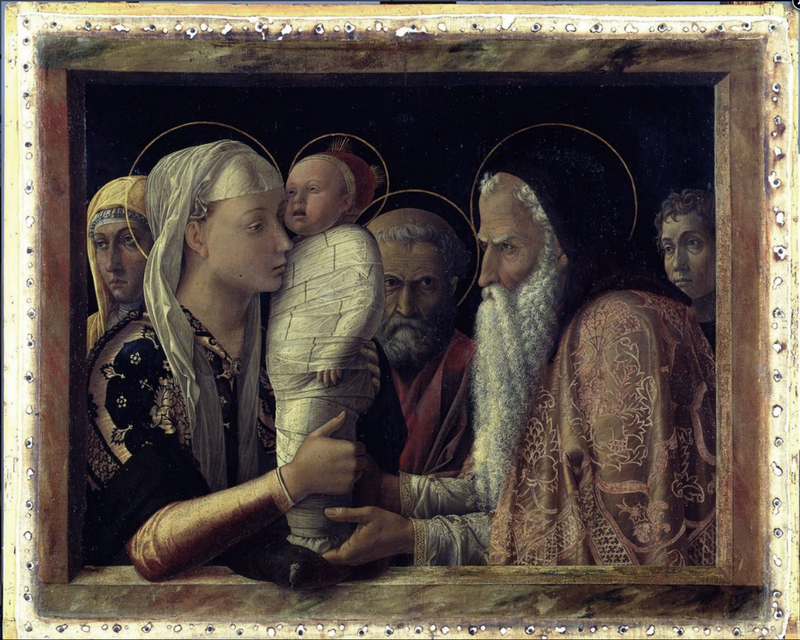 Mantegna’s painting is, like the Simon Madonna, a marble relief made flesh, given colour and breathing humanity. It was getting on the late side for paintings to be put together in this way, as an integrated image and frame; especially since this had been a function of the wooden panel painting with a gold ground, where the frame mouldings would be attached and the gesso and gilding would be applied over the whole face of the work. Mantegna’s Presentation, being dated to the mid-1450s, is accepted as a commemoration either of his marriage in 1453 to Bellini’s sister, or to the birth of their son the next year, and the fact that it includes changes to the composition, and the addition of three subsidiary figures to those of the Virgin, the Child and Simeon, is also taken to indicate that ‘this was a private project, painted for family reasons’ ; this may explain the framing as well. 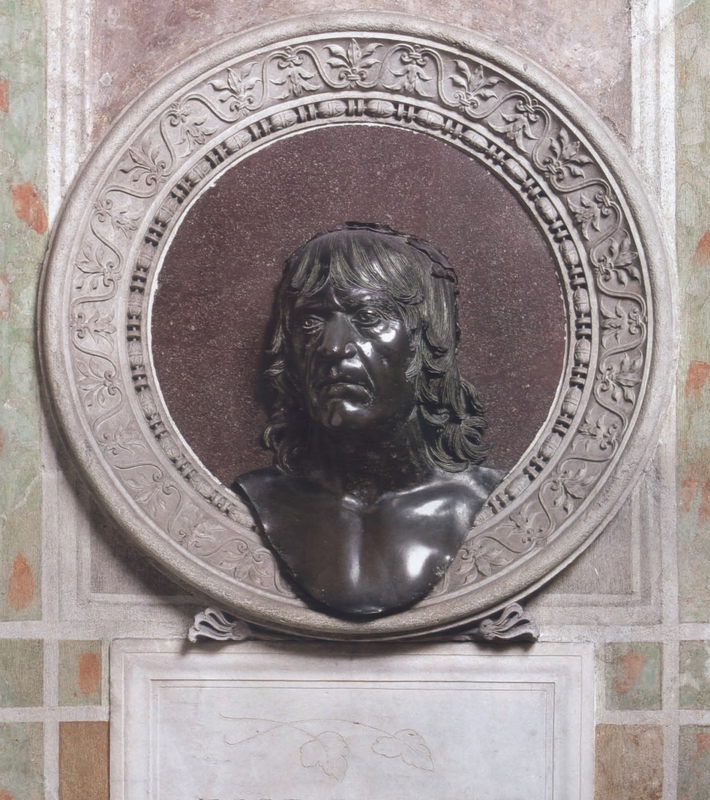 The mouldings were presumably made and attached in Mantegna’s own workshop, rather than being carved and joined to a wooden panel by the carver and gilder, as would traditionally have been done. 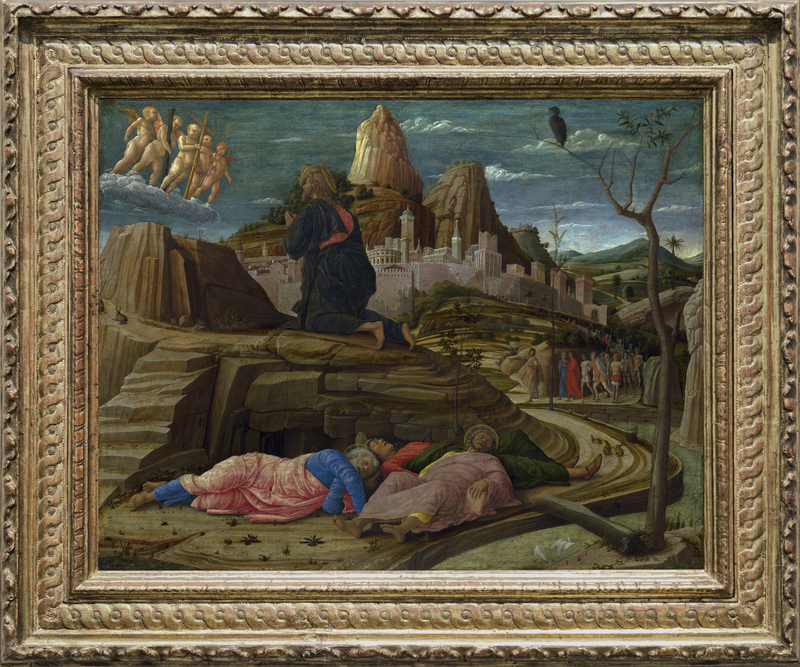 This left Mantegna free to decorate the outer, attached frame to create what would be an image completely integrated visually, as well as physically. Because the outer margin of the canvas is the painted façade of a marble niche, it seems most probable that whatever mouldings were added to the front of the painting continued this marbling, thus creating a realistic, coloured version of what the Madonna plaques represented in white marble. 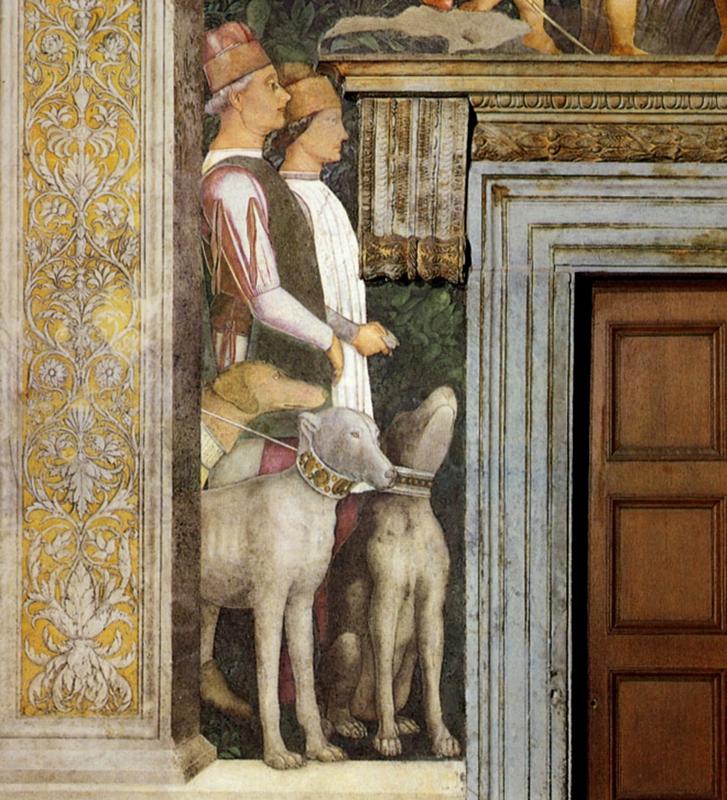 The pigments all over the painting have faded and darkened; what were viridian greens, vermilions and deep blues are now desaturated and greyish , but originally this painting must have glowed opulently – a group of silk-clad Renaissance Italians acting the presentation with stunning immediacy within a marble window inset in the wall of Mantegna’s home. The parcel-gilt and sgraffito’d cassetta now on the painting is far less effective, and actively clashes with the marbled inner frame. 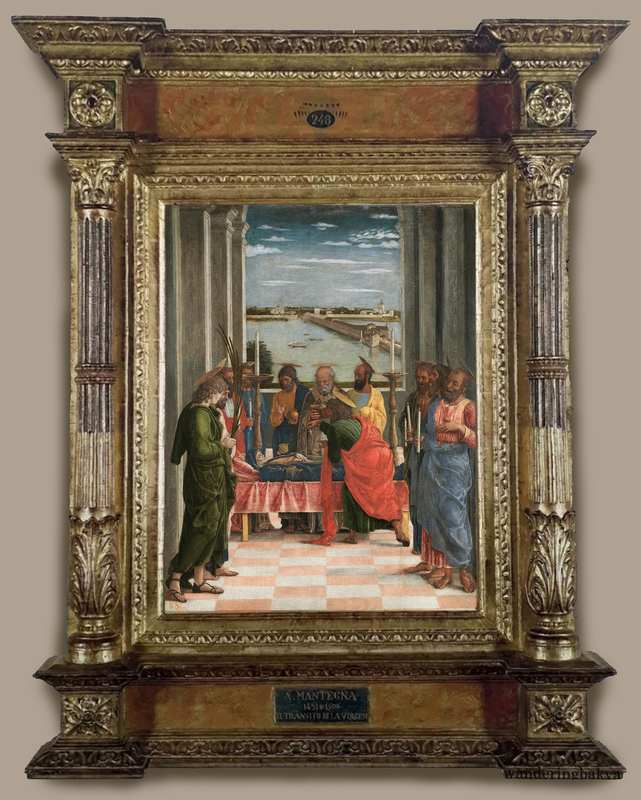 The Bellini Presentation, painted about twenty years later from a tracing of Mantegna’s and enlarged by two more figures, is in a Venetian museum, and has been framed almost identically (save for the colour on the frieze) to the Mantegna in Berlin. This is not a scene which takes place in a marble-framed opening; it is wider and more open; it is a meeting on a landing or terrace, behind a balustrade, and, although its current setting doesn’t do it any favours, it would look entirely wrong in a faux-marbre frame, since there is no way that painted mouldings could carry the fiction of the balustrade into the spectator’s space. 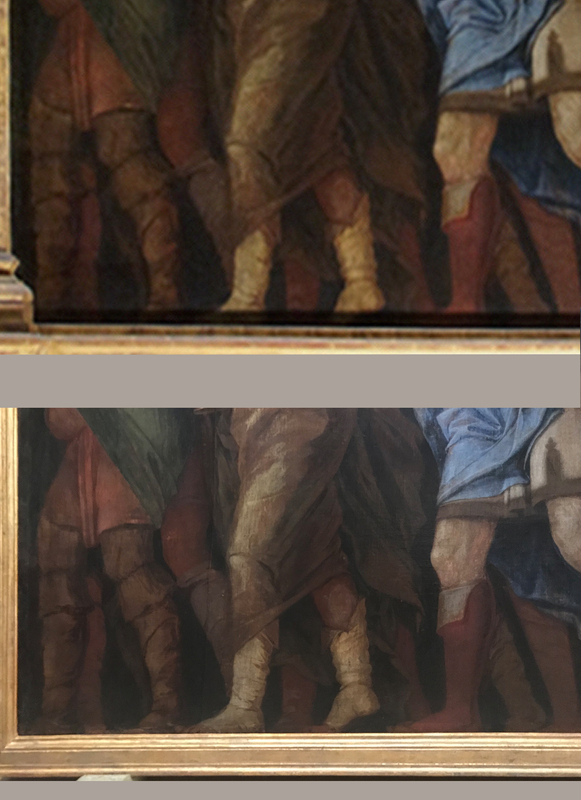 It is fascinating to observe this junction of two paintings with the very same central group of figures, which yet wouldn’t look right in the same setting, and were almost certainly originally framed in very different ways. 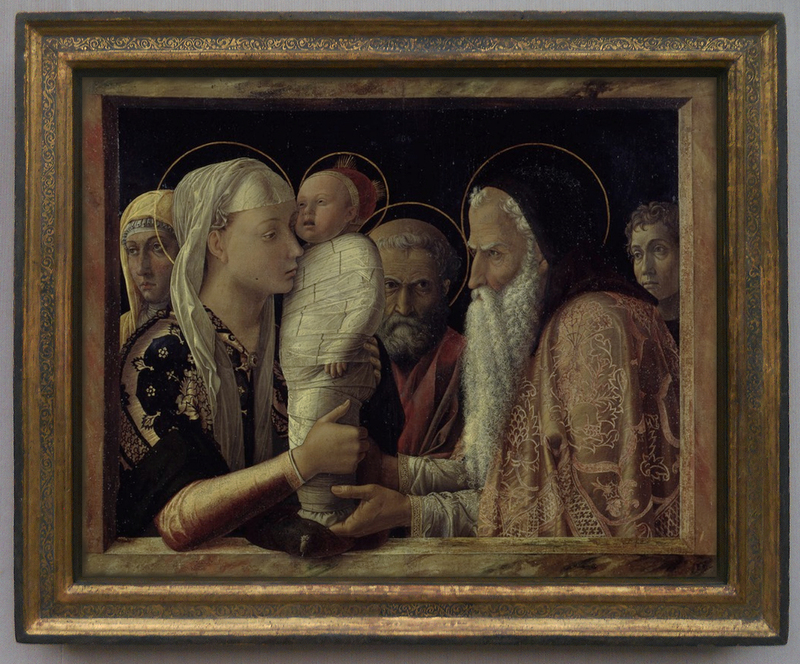 Mantegna utilized his own composition again, forty to fifty years after the Presentation with its family overtones. He painted the Adoration of the Magi in the last decade of his life, but he used a very similar grouping of figures to the earlier work: the same half-length actors, the same intensely expressive glances and the same dance of hands (but where, in the early painting, the Virgin withheld and Simeon grasped, here the Madonna offers her Son, and her guests make offerings in return). The scene is even more closely cropped, although now we have no idea as to where it is taking place; there is no architectural element visible, but only the intense darkness of, presumably, the stable. This is another sacred scene viewed in close-up where there is no way of telling how it might have been framed, although the current frame is problematic in itself. 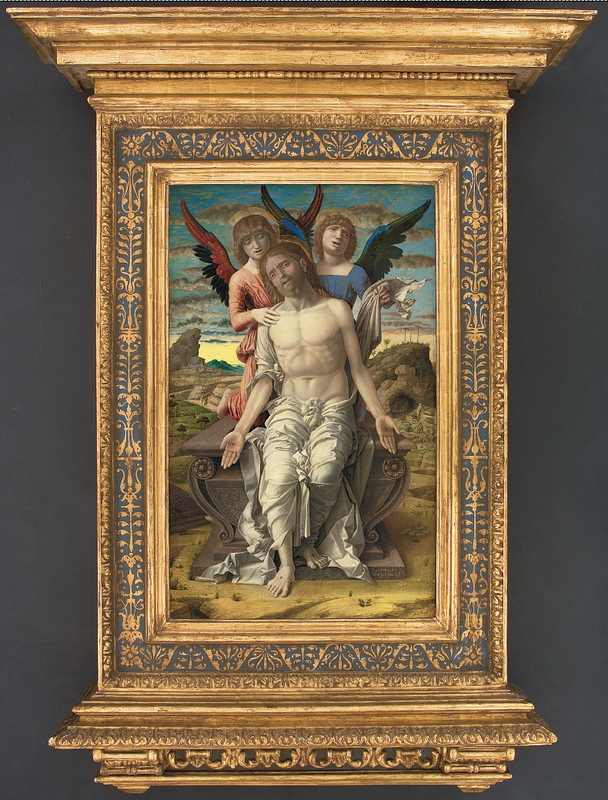 It is an early 16th century pressed pastiglia frame, which is quite common in the version which has a moulded double guilloche on the convex frieze (of which there is an example in the exhibition, reframing Bellini’s St Jerome, above ) but much more rare in the design on the Mantegna Adoration. It obviously makes sense, having figures which are upright relative to ‘down’, whether on the lateral or cross rails. 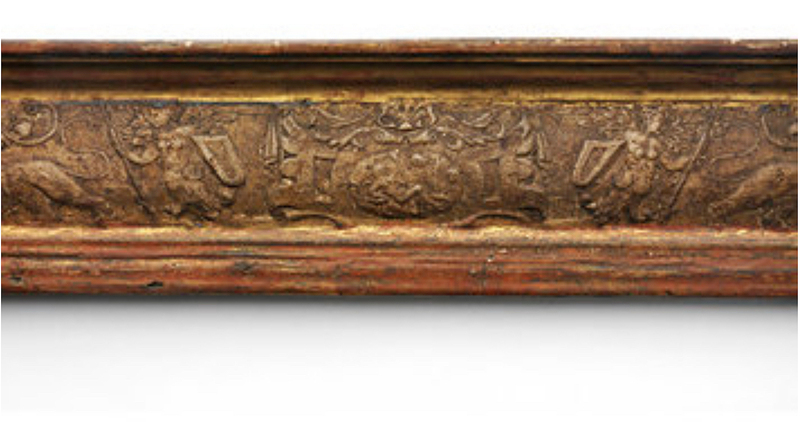 The orientation of the decoration on the Getty frame has no logic at all, as the same mould has been used for all four rails; so that on both lateral rails it runs from top to bottom, while on the cross rails it runs from each centre outward to the corners – creating two bands of striding putti and winged figures who are standing up (as it were) sideways. 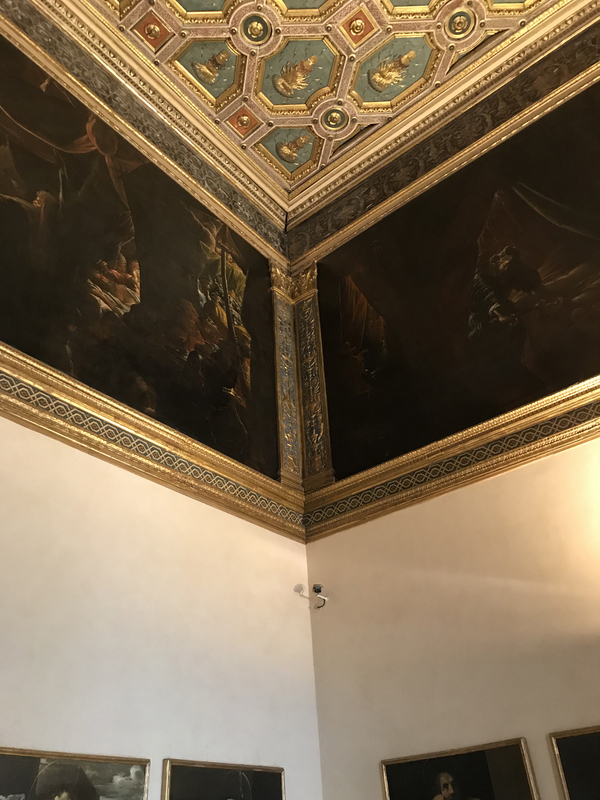 The decoration has also lost its gilding and any polychromy which might originally have been used, and the beige-ish white tint of the bare pastiglia is rather at odds with the painting, where the colours remain much more saturated than in the Presentation. The evidence of the V & A frame seems to indicate that the ground of the pastiglia ornament in that case might have been coloured blue, and the figures and arabesques would have been picked out in gold; if this were the usual practice, it would give a startlingly rich and jewel-like finish – making the choice of such a frame for the Adoration of the Magi particularly unlikely, whilst causing the sideways orientation of the ornament to be even more dislocatingly visible. 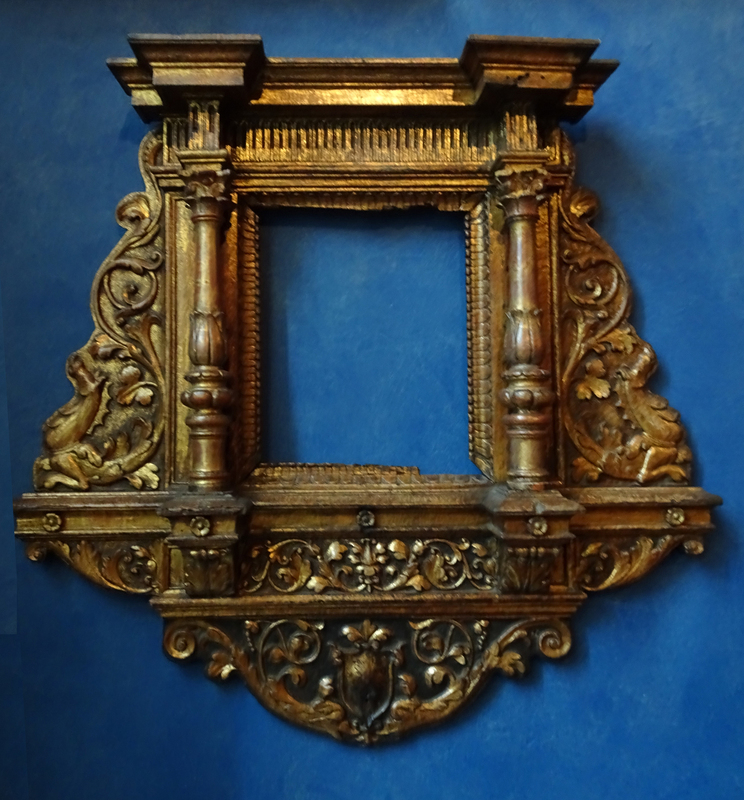 It is hard to believe that a Renaissance craftsman would go to the trouble of obtaining or making such complex moulds, and then use them in such a careless way; possibly the Getty frame has been ‘improved’ in the 19th century, or has had its decoration recreated from a single mould. 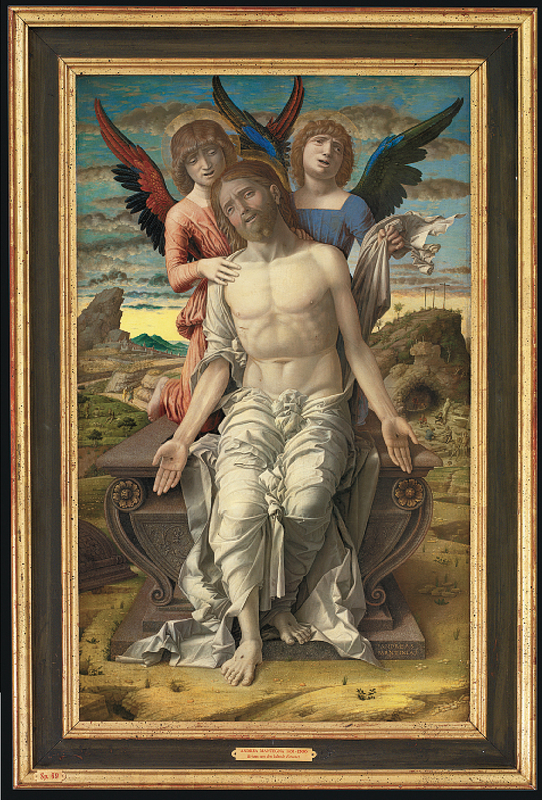 Bellini’s Christ blessing in the Louvre has an even more undiscriminating use of the moulds, since – whilst the top rail has the sideways figures centred, and running right and left to the corners – the bottom rail has a single strip of ornament running from left to right. 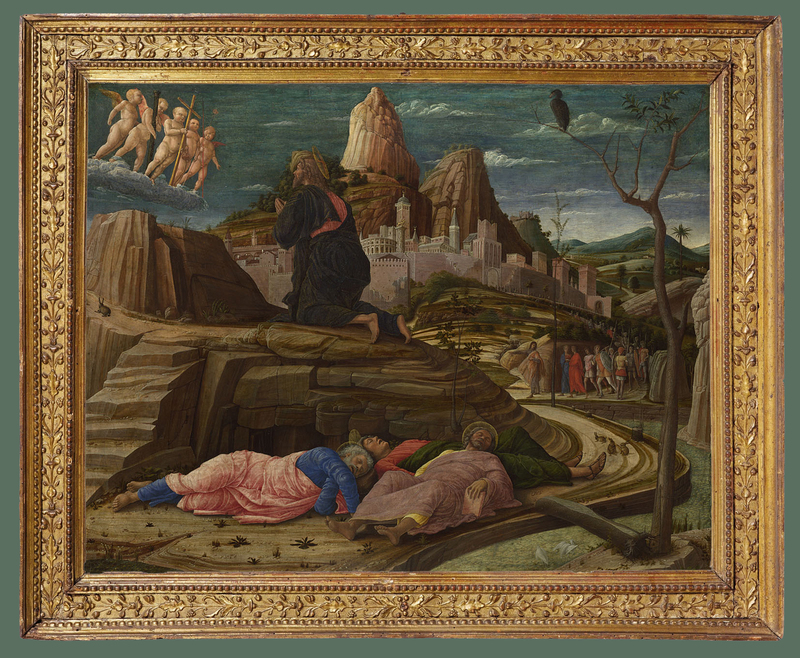 A much more satisfying use of pressed pastiglia can be seen on the current frame of Mantegna’s Agony in the garden, which recently changed its old setting for a late 15th-early 16th century Venetian cassetta. 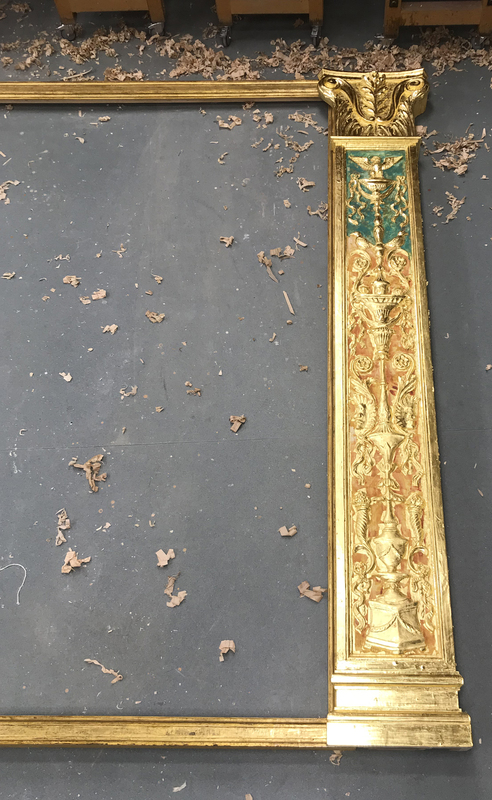 The previous frame was apparently also an Italian cassetta (although dating from the 17th century), but it had been so maltreated, having the gesso layer completely replaced and regilded, that it had the appearance of a 19th century revival. The current frame is much more chronologically appropriate, and the pastiglia ornament extraordinarily refined and beautiful. The frieze, which is bordered by two runs of carved oval beading, has been laid with short strips of pastiglia like tiles, which join to create an elongated vertebrate ornament along each rail in which the motifs include tulip flowers, grapes, and either extended vine leaves or oak leaves, on a ‘punched’ ground. The gilding is especially luminous and soft, surrounding the painting with a clear shimmer of light, and the delicacy and precision of the ornament echo similar qualities in the much grander-scale decoration of the San Zeno altarpiece. This is probably the most exquisite antique frame in the exhibition. In contrast, the grandest and perhaps the most striking reframing of Mantegna in the exhibition may be, sadly, the most temporary. 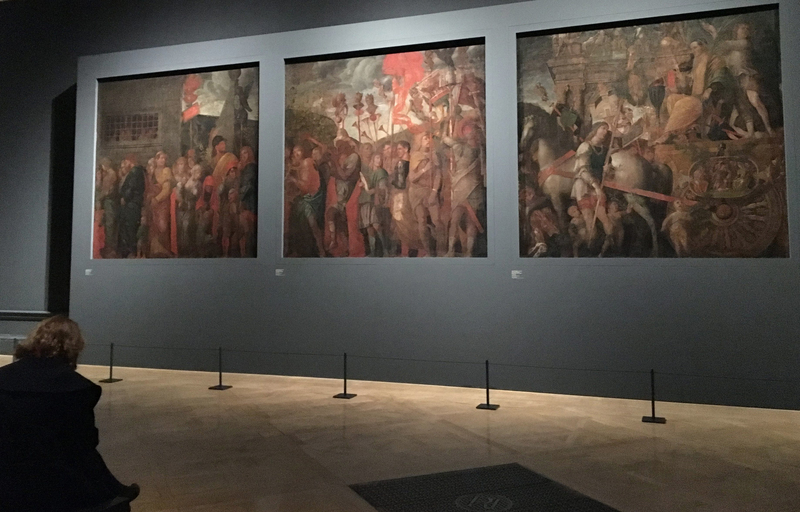 Earlier in 2018 (January to April) the exhibition Charles I: King & collector took place at the Royal Academy, and the nine canvases of Mantegna’s Triumphs of Caesar were shown on three walls of a single gallery, let into massive dull greyish-blue mounts, like some great multi-screen Renaissance video display. This effectively killed all the vibrancy and animation of the paintings completely dead, and made this probably the least lingered-in room of the whole, otherwise stunning, show (strangely, they look more colourful in reproduction). 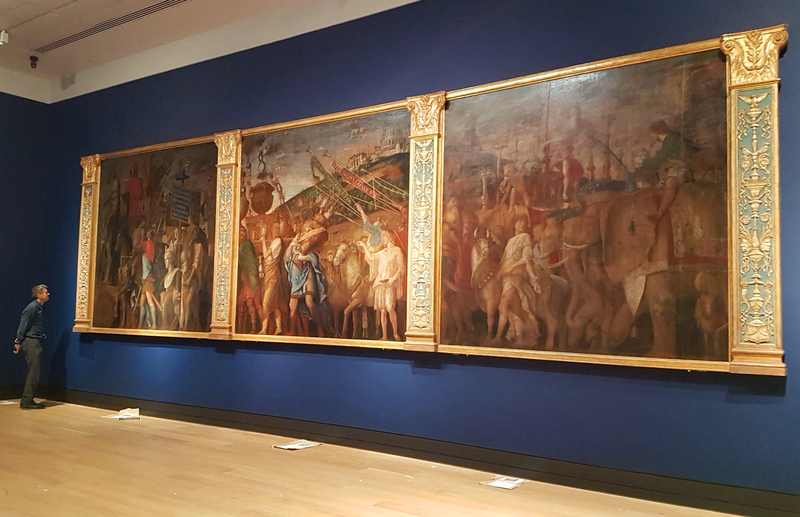 The Mantegna & Bellini exhibition at the National Gallery has borrowed just three of the canvases from their normal resting place on a long wall in Hampton Court Palace, where they have lived since about 1630. 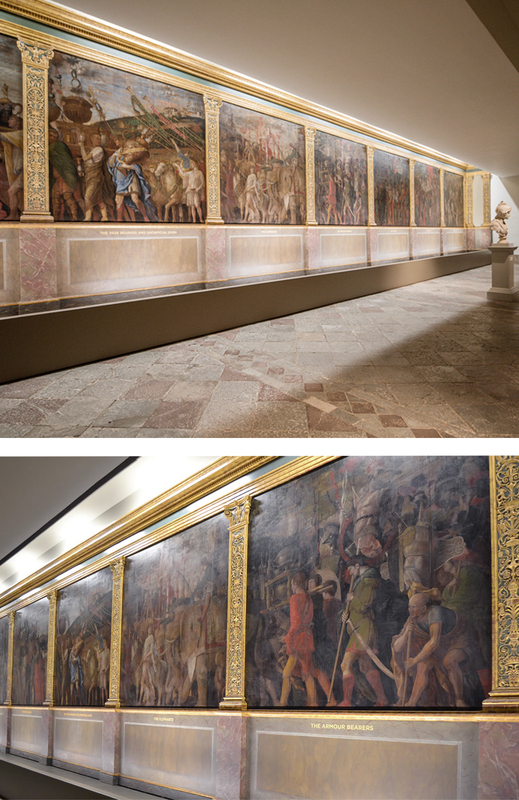 It is a particularly long wall, as each painting is nearly 9 feet high and just over 9 feet wide, and the total width is extended by the pilasters inserted between each panel and enclosing them at either end. 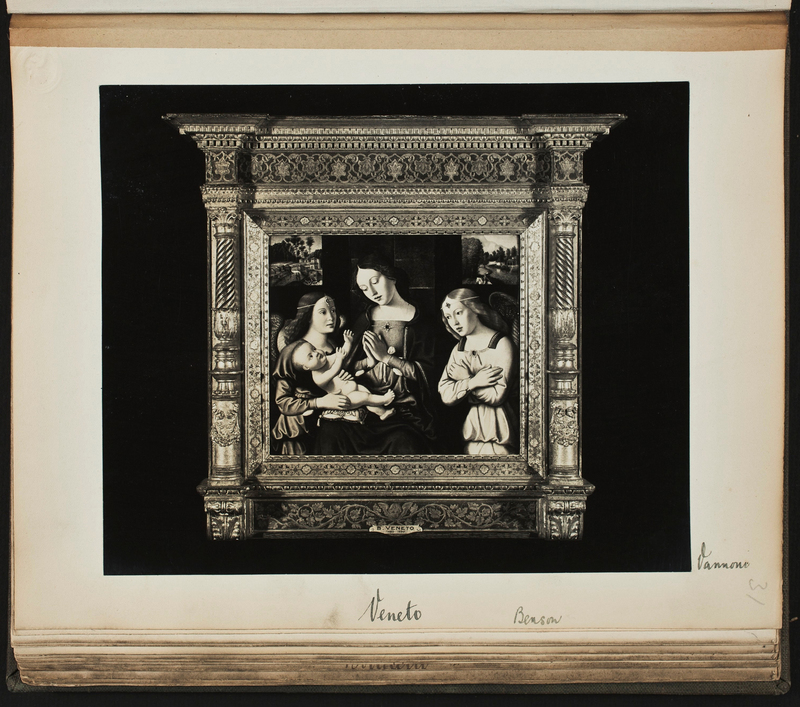 This huge framing device was made in the workshop of one of the most famous London framemakers and dealers – Paul Levi, who helped to recreate an interest in antique picture frames in Britain in the teeth of minimalism and modernism. It dates from the last quarter of the 20th century, and it is not an accurate reproduction of the original frame but a re-imagining of what the frame might been, based on contemporary knowledge, and possibly made by assistants rather than by Paul Levi himself. 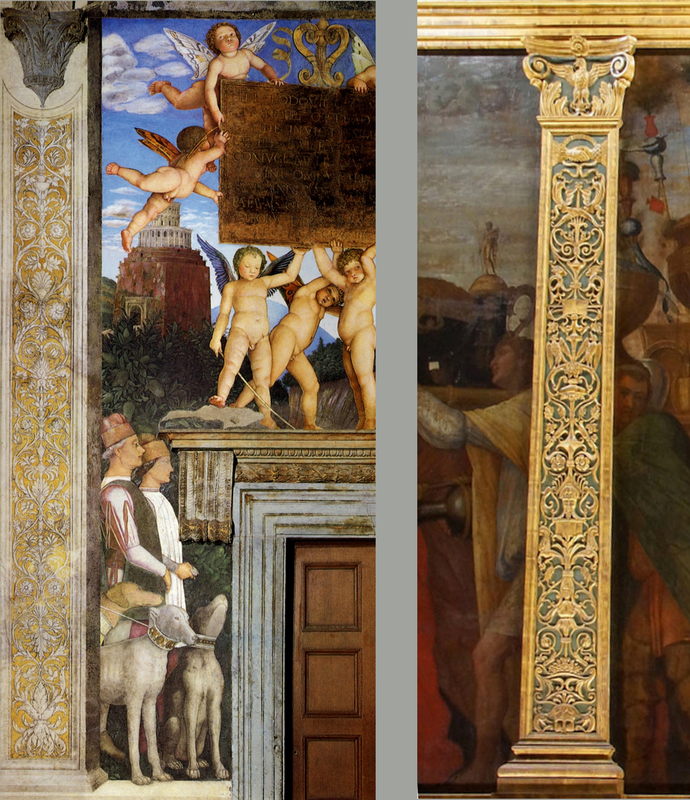 If a detail of a pilaster from the Hampton Court installation (on the right) is compared with a detail of a pilaster painted in fresco by Mantegna in the Camera degli sposi, Mantua (on the left), it can be seen that the 20th century pilaster lacks all the flowing logic and rhythm of the 15th century ornament; it is in comparison heavy, crowded, badly-organized, and bears very little relationship to the ordered classicism of Mantegna’s own design. Meanwhile, some of the original pilasters which held the cycle of The triumphs of Caesar in the Palazzo di San Sebastiano – part of the town-sized palace complex of the Palazzo Ducale, Mantua – have been salvaged from their first location and installed in the Stanza di Giuditta, along with a coffered ceiling from elsewhere. 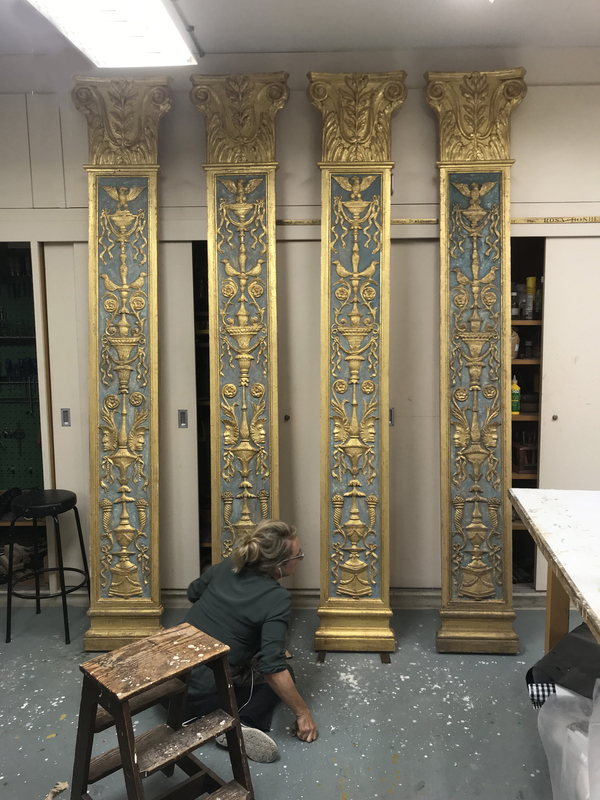 These were photographed by Peter Schade (with some difficulty, as they are now high in the air), and used to create drawings in the National Gallery workshop for an authentic pilaster frieze. A great advantage of the new setting with its inner plain gilded frame is that, instead of the painted figures wading ankle-deep in black mud, they are now walking along the golden ledge itself, bringing the whole procession into a much more direct relationship with the spectator – just as in Mantegna’s Camera degli sposi. It is altogether a great shame that the frames can’t remain with the paintings, the rest of the canvases being given similarly authentic and beautifully-made settings to match; and a further shame that they won’t accompany the canvases on the next leg of their exhibition journey, to the Gemäldegalerie in Berlin. See them while you can – at the National Gallery until 27 January 2019. Mantegna’s Judith was sold by Duveen and Agnew to Joseph Widener, the wealthy business man whose collection formed the core of the National Gallery of Art, Washington, to which it was bequeathed in 1943. 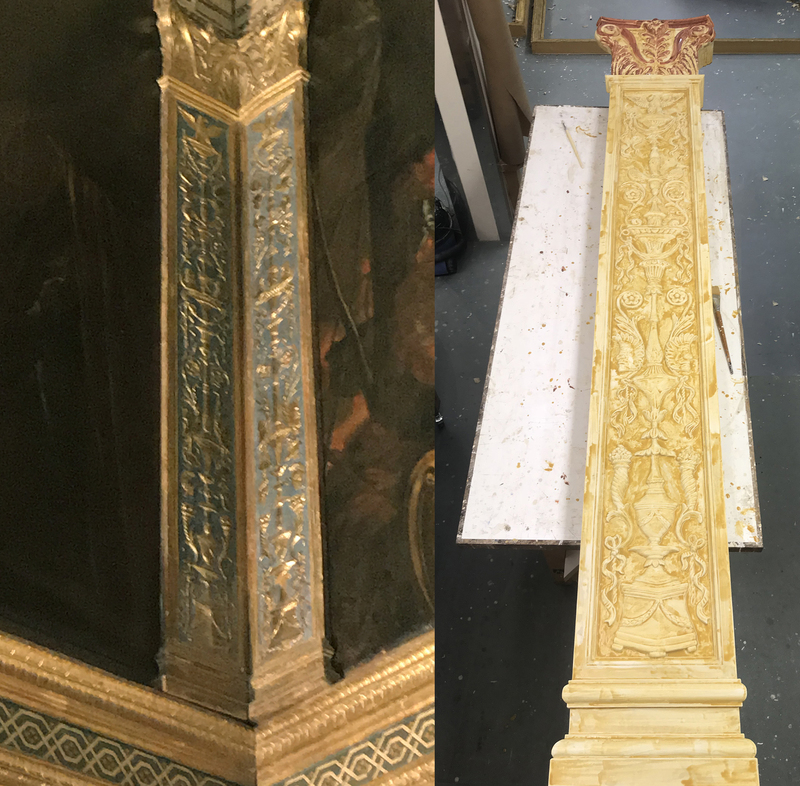 The Judith arrived in its current frame; Steve Wilcox, late of the NGADC, suggests that it might have been reframed by Widener’s restorer and frame dealer. 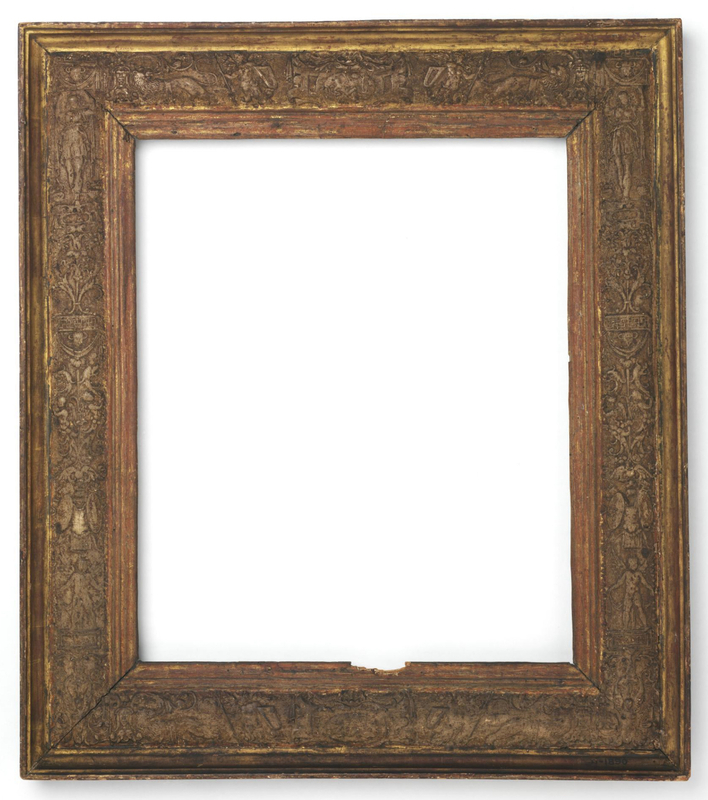 It is certainly very unlike a Duveen frame, but Duveen might have thought that a half-share in it didn’t warrant the full Vannoni. Ibid., p. 57; the description of the changes to the pigments also notes the overpainting of the background, and the fact that the haloes are therefore later additions.